IEC 61111:2009 Class 2 electrical safety matting is specially compounded to meet the higher working voltage of 17,000V AC and is 8mm thick. These tests mean that you can be confident that every batch and every linear metre of matting will perform its critical purpose of protecting electrical workers to a working voltage of 17,000V AC. We can supply certification for every supply of IEC 61111 Class 2 matting. 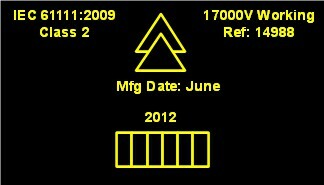 On the back of the matting there will be yellow markings that will identify the manufacturer, a double triangle that indicates that it is suitable for live working, IEC 61111 and class, month and year of manufacture and category if applicable. IEC 61111:2009 Class 2 matting is available in 10 metre fine ribbed black rolls in three widths 0.914, 1.0 and 1.22 metres. Currently stock is on a 4 weeks lead-time for all widths.